Among the first plants to flower in the spring, prairie star is commonly found in the open, grassy areas of the shrub-steppe. The lobed white or pink petals cluster in ‘stars’ atop leafless two to ten inch stems. 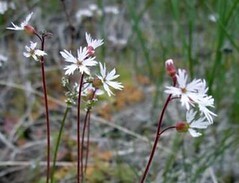 Leaves grow mostly at the base, about half to one inch long, with five wedge-shaped segments with three rounded teeth. The slender stems can be green or a distinctive dark red to purple. This plant is called “bulbous” due to the reddish bulblets in intervals along the stem. The bulblets look like connectors between the stem segments. The bulblets fall to the ground, root, and produce new plants. This plant is thus called viviparous--a plant that reproduces by developing a new plant identical to itself while still attached to the parent plant. The fibrous roots have small bulblets that are a popular food among rodents but produce toxins that may poison domestic livestock.